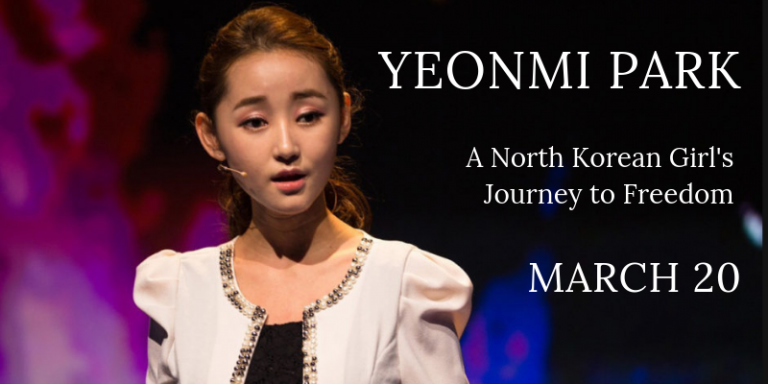 PennsylvAsia: Yeonmi Park: A North Korean Girl’s Journey to Freedom, March 20 at Kelly Strayhorn Theater. Yeonmi Park: A North Korean Girl’s Journey to Freedom, March 20 at Kelly Strayhorn Theater. North Korean defector, author, and activist Yeonmi Park will speak at the Kelly Strayhorn Theater in East Liberty on March 20. Registration information is not yet available. Twenty-four-year-old human rights activist and North Korean defector Yeonmi Park is fast becoming a leading voice of oppressed people around the world. At the 2014 Oslo Freedom Forum and the One Young World Summit in Dublin, she became an international phenomenon, delivering passionate and deeply personal speeches about the brutality of the North Korean regime. Her speech from the One Young World Summit has been viewed over 80 million times. Watch it here. Born in Hyesan, North Korea, Yeonmi grew up in a society devoted to the worship of Dear Leader Kim Jong-Il and hatred for enemies of his regime. It was normal for Park to see dead bodies as she walked to school and to be so hungry she ate wild plants. In 2002, Yeonmi’s family suffered a crucial blow. Her father, who smuggled gold, nickel, and silver before being caught, was tortured and sentenced to 10 years in a forced labor camp. After his early release on medical leave, the family decided they had to flee North Korea, but became separated before they could escape together. In 2007, Yeonmi and her mother crossed a frozen river into China, hiding from Chinese authorities who would return them to North Korea. Two years later, they reached the Mongolian border and spent a freezing night in the Gobi Desert, dodging patrols and crawling through barbed wire to seek refuge to South Korea. Yeonmi’s searing memoir about her escape, In Order to Live: A North Korean Girl’s Journey to Freedom, was released in the fall 2015. Yeonmi has taken it upon herself to tell the story of millions, urging the world to recognize the oppressed people of Kim Jong-Un’s reign. She believes that change will come through young people like herself, whose exposure to capitalism and Western media is eroding the authority of the Kim dynasty. Currently a student at Columbia University, Yeonmi has published an op-ed about North Korea’s “Black Market Generation” in the Washington Post, and has been featured on CNN, CNBC, and the BBC, as well as in The New York Times and The Wall Street Journal. She serves on the board of directors of the Human Rights Foundation. Progress on Oakland's TW Kitchen (台味廚坊). Arden Cho at Pitt, March 2. Black and gold gloves for infielder Bae Ji-hwan. A final good-bye for the old Kim's Coffee Shop? Lunar New Year Celebration, February 15 at Pitt. Saigon88 Express now open in Robinson.